New steel cannot be produced without recycling old steel. It’s a basic fact of domestic steel production. And for LTV’s Indiana Harbor Works in East Chicago, Indiana, it means more than 75 years of recycling. Indiana Harbor Works has been producing steel since 1916. Located on approximately 1,200 acres of land bordering the southern tip of Lake Michigan, the mill annually produces more than 3.3 million tons of flat-rolled steel for use in steel products such as automobiles, appliances and cans. All this steel is produced by the mill’s pair of basic oxygen furnaces. Steel scrap is combined with molten iron and other materials in each furnace to produce a “heat” of steel. Each heat takes about 45 minutes to make. The mill obtains its supply of steel scrap from three sources: “home’ scrap, derived from the industrial manufacture of steel products; and “obsolete’ scrap, derived from steel products that have come to the end of their useful lives. Indiana Harbor Works purchases all grades of steel scrap from intermediate processors. Last year, the mill’s overall recycling efforts included more than 22,000 tons of steel cans. Densified bales of steel cans are shipped to the mill by rail or truck and stored outside. Rail cars transport the steel scrap to the mill’s basic oxygen furnaces to be recycled into new steel. In all, the mill recycled more than 932,000 tons of steel in 1992. Representatives of solid waste organizations, government agencies, trade associations, and the aerosol and steel industries meet at a two-day aerosol recycling conference hosted by S.C. Johnson Wax in Racine, Wisconsin the summer to discuss how best to expand the recycling of empty steel aerosol cans. Steel aerosol cans are easy to prepare for recycling through community recycling programs. Once a steel aerosol can’s product is expended through normal use, the container is empty and may be recycled. Empty steel cans, including aerosols, are magnetically separated from the other types of recyclables at secondary processing facilities. After separation, the steel cans are baled and shipped to steel mills and foundries to be recycled. Some basic misconceptions have hindered the steel aerosol can’s inclusion in recycling programs that already accept other forms of steel cans. 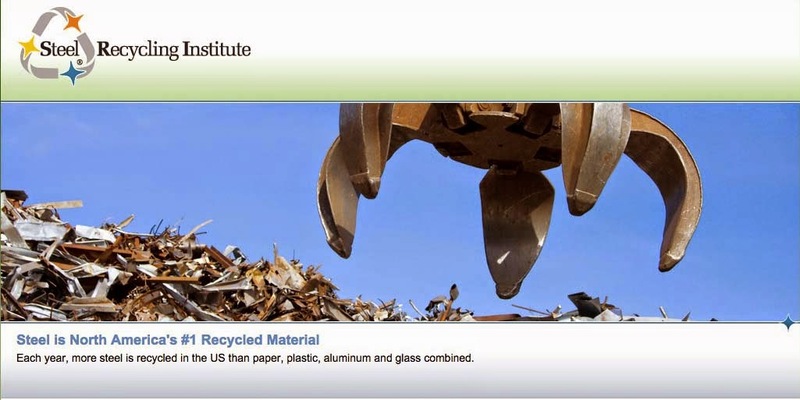 The steel industry is overcoming misconceptions by providing responsible advice on the container’s ready recyclability and the steel can’s recycling strengths: ease of preparation, magnetic separation and availability of end markets. Conference representatives concluded that the more than 4,000 curbside recycling programs already accepting empty steel food and beverage cans may easily incorporate empty steel aerosol cans. These programs would benefit from the can’s incremental scrap revenue and increased diversion from the landfill. Currently, more than 550 communities collect empty steel aerosol cans for recycling through curbside and drop-off programs. Hundreds of additional communities automatically recycle steel aerosol cans through magnetic separation at resource recovery facilities, which typically serve large metropolitan areas. It was also concluded at the conference that awareness efforts regarding recycling empty steel aerosol cans needs to be more effective. Furthermore, recommended partnerships among groups with an interest in recycling, including government, private industry, and trade organizations, would increase the growth of empty steel aerosol can recycling, with the ultimate goal of inclusion in all steel can recycling programs. Cans: The Food and Drug Administration recently proposed a ban on the use of lead solder used to seal side seams of food and beverage cans. The move would only affect foreign can manufacturers because U.S. food and beverage can manufacturers stopped making lead-soldered cans in 1991. Cars: According to Garbage magazine, over the past 20 years, Kentucky community groups working with the state have collected and sold approximately 41,000 abandoned out-of-service cars to ferrous scrap dealers. Recycling cars raises money for the groups, cleans up the environment and creates jobs. Appliances: The Allegheny County Department of Waste Management, along with U.S. Steel Group, Duquesne Light, and Tube City Inc., are hosting a special fall clean-up program for steel appliances and other scrap metal items. The annual event, now in its second year, will be held on October 23rd and 30th at different sites across Pittsburgh and Allegheny county. Last year, organizers collected more than 100 tons of steel appliances for recycling. Steel cans (and other recyclable food containers) must be rinsed for basic sanitation because they are usually stored for a period of time before they are picked up or delivered for recycling. Rinsing only requires the removal of most food particles. It is important, however, to rinse cans and other containers without wasting water. No one wants to exchange one precious resource for another. To make the best use of water already used in the kitchen, rinse steel cans in leftover dishwater used to wash pots and pans. Or run them through an automatic dishwasher in available empty space. Steel cans may be flattened manually or mechanically to reduce their volume so that they can be more efficiently stored and economically transported. For manual flattening, trim the bottom end from the rinsed can in the same way that the lid was removed. Step on the body of he open-ended can to flatten it for storage. Lids have sharp edges, but can be stored in an empty can until it is fully of lids. This can may then be crimped or taped shut for carrying to storage. Mechanical flattening is done with a specially designed machine, which effectively flattens all sizes of metal cans (with the bottom end intact). Commercial businesses and institutions should contact their waste hauler to negotiate arrangements that provide for the recycling of steel cans and other materials. This normally means that the hauler provides and services a container for the recyclables. The cost of this service should be balanced against the incremental revenue from the scrap value of the recyclables and avoided solid waste removal costs. An alternative is to work with a ferrous scrap processor or independent recycler. Arrangements may be made to have steel cans (and other materials being recycled) picked up, or to deliver them to a scrap yard or recycling facility when a suitable load is accumulated. Through curbside, commercial/institutional and drop off recycling, more than 5,000 tons of steel cans were removed from Washington, D.C.’s solid waste stream in 1992. Implemented in 1989, the curbside program has grown in phases to include more households place recyclable containers, including steel, aluminum, glass and plastic, into blue bags. The residents also tie cardboard, newspaper and magazines into bundles and place them into green recycling bins. Both the bags and the bins are set at the curbside once a week, the same day garbage is collected. City businesses are also required to separate steel and aluminum cans, glass and plastic containers, newspaper and office paper from their solid waste. It is estimated that 70 percent of the city’s solid waste stream is produced by local commercial establishments and businesses. Although businesses may have private haulers handle their recyclables, city recycling officials provide technical support. Collected recyclables are delivered to Georgetown Paperstock, where they are placed on a conveyor belt and the steel cans are magnetically removed. The steel cans are baled and shipped weekly to AMG Resources Corporation, a detinning facility in Sparrow’s Point, Maryland. Many Massachusetts residents are changing their solid waste into electricity. That change is giving them even more power - the power to recycle virtually all their steel cans. About 40 communities in southeastern Massachusetts (including cape Cod and Martha’s Vineyard) ship their solid waste to the SEMASS resource recovery facility. Municipal solid waste is delivered directly to the facility’s tipping floor via train or truck. Recyclable and bulky materials are removed, and the remaining solid waste is loaded onto a conveyor belt and passed through shredders which reduce it to a size of six inches or less. About 75 percent of the steel scrap is then magnetically removed and loaded onto a separate conveyor belt. The belt feeds the steel cans and scrap directly into trucks, which deliver the scrap to regional secondary processors and steel mills. Approximately 100,000 tons of steel scrap have been recovered for recycling since the facility opened in 1989. The remaining 25 percent of the ferrous scrap that enters the boilers falls to the bottom of the incinerator system. The steel cans, scrap, and nonferrous metals, along with a byproduct of the incineration process (ash) is collect and conveyed to the facility’s ash processing plant where steel cans and scrap are magnetically recovered for recycling. Because steel is magnetically separated, participation in this recycling effort is virtually 100 percent. In addition, many of the communities separate steel cans from he solid waste stream through residential recycling programs. The steel cans, scrap and nonferrous metals recovered from the post-combustion process are taken to regional secondary processors. SEMASS is owned by the SEMASS Partnership, a group of subsidiaries of Energy Answers Corporation, ESI Energy, inc., Bechtel Group, Inc., and Stephens, Inc., and managed by SEMASS Corporation, a subsidiary of Energy Answers Corporation. In the fall of 1991, a study focusing on a pilot recycling program of additional plastics in the town of Lincoln, Rhode Island addressed the effectiveness of public education. Researchers hoped to learn not only how effective public education is, but also how participation rates increase with the addition of other materials. The study was performed by the Rhode Island Department of Environmental Management, the Rhode Island Solid Waste Management Corporation and the town of Lincoln. Some of the study’s findings focused on other materials in Lincoln’s program, including steel cans. Specifically, over a four week period, researchers analyzed the recycling or “capture” rates of recyclable materials from five percent of the Lincoln households participating in the study. To determine the capture rate, the collective weight of one type of recyclable material found in the households’ recycling bins was compared to the weight of the same type of recyclable material found in the households’ municipal solid waste. Approximately 118 pounds of steel cans were collected for recycling from these households. Further analysis of their municipal solid waste indicated that this figure, 118 pounds, represented a capture rate for steel cans of nearly 79 percent. After the distribution of a flyer about plastics, the quantity of steel cans collected in the following four weeks rose by 19 pounds, an increase of approximately 16 percent. Capture rates were not analyzed in the following four weeks. In the study, similar statistics were kept for other recyclable materials in the community’s program. Lincoln is entering its fourth year of recycling. Some 6,000 households place steel and aluminum cans, glass containers, and plastic milk jugs and soda bottles into recycling bins. Newspaper is placed into a paper shopping bag and set on top of the bin. The recyclables are collected once per week, the same day as garbage. Several communities in the Franklin Township area have had the opportunity to recycle empty steel paint and aerosol cans for about 20 years. But with the opening of the Franklin Township Recycling Center in March 1991, more than six communities are being given the same opportunity. The Franklin Township Recycling Center accepts most types of empty steel containers for recycling from eight western Pennsylvania counties, including Allegheny, Beaver, Butler, Clarion, Fayette, Mercer, Warren and Westmoreland. As a result, the facility handles as much as 12,000 pounds of empty steel food, beverage, paint and aerosol cans a day. Little needs to be done to prepare steel paint and aerosol cans for recycling. Steel paint cans must be empty, and the remaining thin coat of paint should be allowed to dry. Aerosol cans should be empty of their product and the removable plastic cap taken off; spray nozzles should not be removed. Novalesi frequently fields questions about how to prepare steel paint cans for recycling. In addition to steel cans, the center accepts aluminum cans, plastic and glass containers, newspaper, magazines, cardboard and high grade office paper. Commingled recyclables are placed onto one of the four loading docks to be passed along a conveyor belt. Steel cans are then magnetically separated from the mix of recyclable material and processed into bales weighing 2,000 to 2,300 pounds. The cente4r produces five to six bales a day to be delivered to area end markets. Franklin Township’s original recycling center was a three room structure built by Novalesi, then an Ellwood City teacher, with help of high school students from his Youth For America group. The center first accepted empty steel paint and aerosol cans for recycling in 1969. Del Monte’s container manufacturing plant in Rochelle, Illinois is simply known as Plant No. 115. It’s recycling program, however, is not as simple as its name. A mixture of multimaterial reuse and recycling extends outward to include both its employees and residents of the surrounding community. “It was a natural step for us to take,” said Dennis Ruehlman, a production supervisor for the plant. “Although the town of Rochelle has its own recycling program, many of our employees live in rural areas not covered by any sort of recycling program. We wanted to extend the opportunity to recycle to those people”. Beyond recycling damaged steel cans and steel can scrap at the plant, Del Monte provides employees with recycling containers for both home and office use. By allowing recycling bins to be taken home, employees are able to store and bring steel cans and other materials to the plant for recycling. Containers for recyclables are also located at employees’ desks and work stations. The plant accepts steel food and beverage cans, aluminum cans, cardboard, newspaper, white paper and magazines. Del Monte’s facility has opened its doors to four local elementary schools and junior high. Periodically, the schools bring bins of white paper and magazines saved by the students, faculty and staff to drop-off locations just inside the plant. Empty steel cans and steel tinplate scrap are collected into large containers throughout the plant. Each container is emptied by a plant forklift operator. The steel cans and steel tinplate scrap are taken to AMG Resource Corporation, a detinner located in Gary, Indiana, where the cans are processed and baled. The steel can scrap is then shipped to local end markets. In addition to recycling, the Del Monte plant also reuses slightly flawed steel cans for non-food special use. An arrangement was made between Del Monte and a nearby workshop for the developmentally disabled in Oregon, Illinois. A number of 15-ounce cans with minor defects or flaws are set aside at the plant instead of being recycled. These cans are taken to the workshop, called the Village of Progress. There, Village employees work to turn the cans into piggy banks. Like many of its predecessors, the Bath Iron Works continues Maine’s tradition of shipbuilding. Located along the banks of the Kennebec River, the half-mile long shipyard constructs primarily large naval vessels. In January 1992, however, the Bath Iron Works began a tradition of its own: the recycling of empty steel paint and aerosol cans. Steel paint and aerosol can scrap is generated by the shipyard because the vessels are painted during construction. A system to ensure the removal of empty, dry paint and aerosol cans from the shipyard’s solid waste stream was implemented. Five paint dispensing centers distribute paint in cardboard holders to employees. Paint is poured into the cardboard holders, and any paint left over from construction is emptied into 55-gallon drums. Emptied paint cans are then placed into small bins and allowed to air dry. Distributed aerosol paint cans once completely empty are collected in small bins and are then returned to the dispensing center. Daily, these bins are loaded onto a pallet and taken by forklift to the shipyard’s centrally-located processing center. The center contains a can crusher and a pair of drum compactors to store the cans for recycling. The paint cans are crushed and placed into a large roll-off. Similarly, aerosol cans are run through specialty equipment to de-pressurize and compact them into large 55-gallon drums. The drums, along with any damaged drums, and steel welding wire cans are also placed inside the roll-off. An empty roll-off is swapped for the full roll-off bimonthly and transported by truck to an intermediate processing facility. There, steel cans are magnetically removed from the roll-off and placed into a compactor to be baled. The baled cans are magnetically moved for shipment to domestic ad foreign end markets.